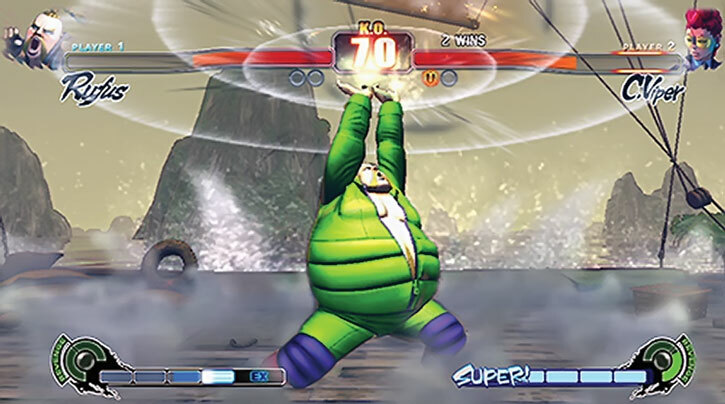 Rufus is a minor character in the venerable series of Street Fighter video games. 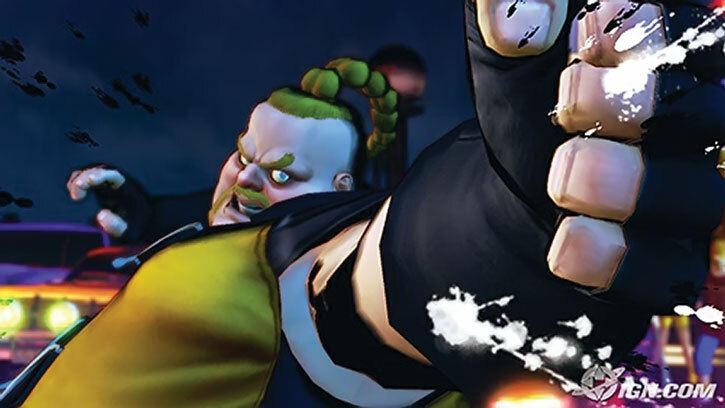 He’s a relatively recent one, having debuted in SF4 in 2009. 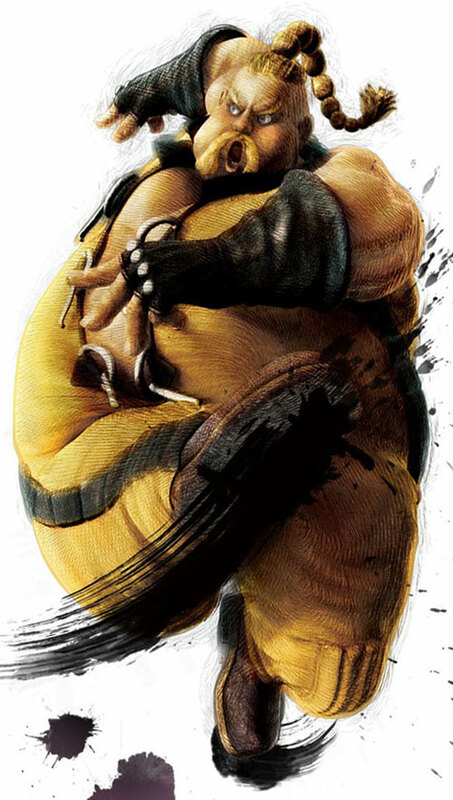 He can work in many settings as an atypical martial artist, and is often used as comic relief. Base Of Operations: Mobile throughout America. Height: 6’6” Weight: 407 lbs. Rufus, although not very bright is a skilled martial artist. He was good enough to win the Midwest martial arts championship. He’s also talented as both a biker and singer. Fighting freely with his self-taught kung fu, the self-proclaimed Pan-American number one fighting stylist regarded Ken Masters as an intense rival. 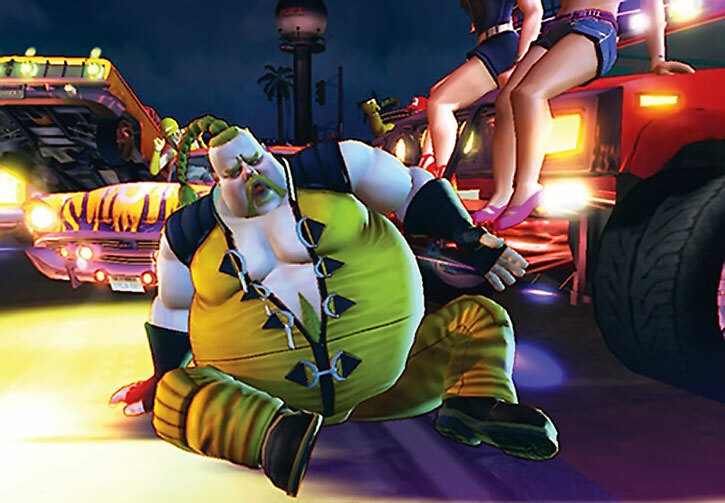 Thus, Rufus challenged Ken to fight for the plain sake of to see who was stronger. Jumping to conclusions, Rufus frequently mistook random martial artist for the elusive Ken. 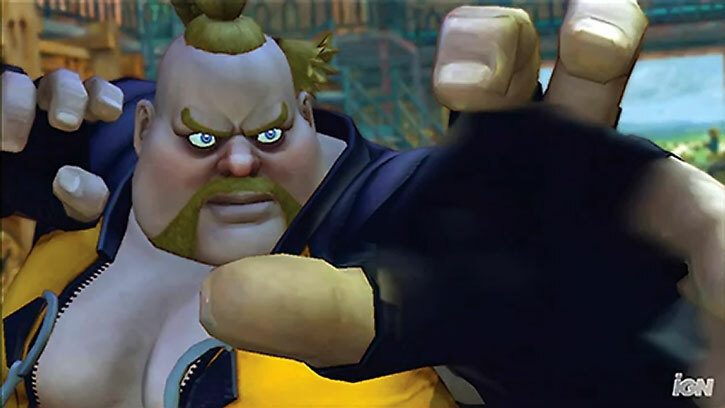 Rufus in his SF4 opening read in the newspaper that Ken was the strongest fighter in the US. ”Absolutely not !” he bellowed. He was and he would prove it to the world. 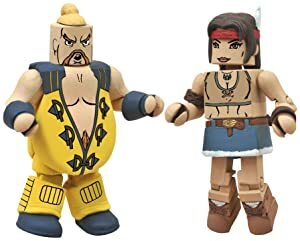 His girlfriend Candy suggested that they fight on live TV so that Ken would be publicly shamed. Rufus happily agreed and swore that Ken’s days of fame were numbered. Rufus mistook just about everyone blond for Ken. But he most likely did run into the real Ken, judging from their identical rival battle scenarios. Even if Ken actually mopped the floor with Rufus, his ending had them meeting up yet again. This occurs as Rufus plunges ahead across the desert on his bike with Candy at his side. And then once more as the bike got stuck. Candy lost her hat to the wind so Ken replaced it for her as he pulled up to them, and offered them a hand. Rufus was about to blow blood vessels from his pushing the bike and refused, insisting that it was training as well. But as Ken left Rufus convinced himself that Ken must have sabotaged his wheels beforehand. Still with Candy and trying to get even with Ken. 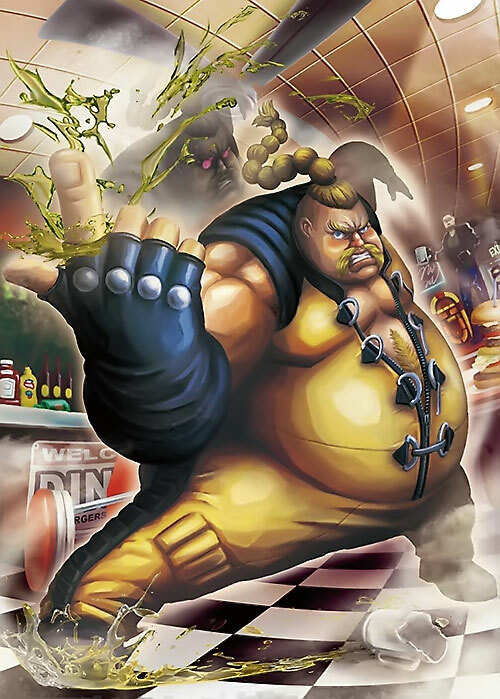 Will SSF4 actually have him succeed ? Time will tell. Rufus is a giant tub of lard. But he moves surprisingly fast for a man of his size and build. 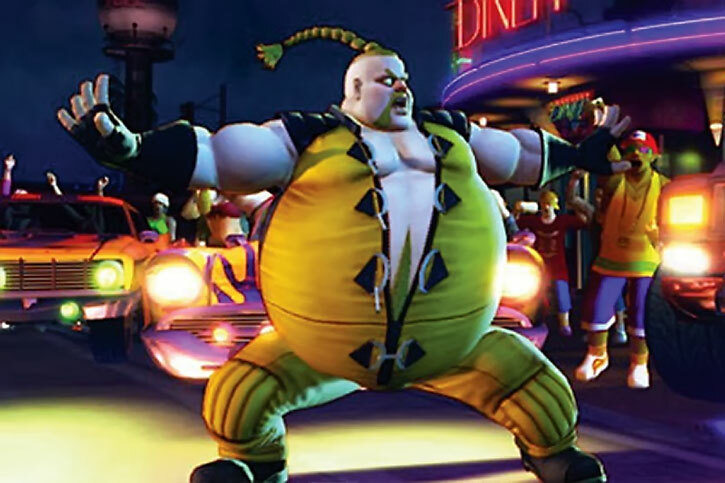 He typically wears a yellow and black skin tight sleeveless jumper that looks like it’s about ready to be ripped apart by his flab. The back and sides of his hair are shaved and the rest of his long blond hair is worn in a single braid. He can frequently be seen making goofy faces while loudly boasting about his abilities and sexiness. He is quite fond of making the “I’m number one !” gesture. The story pretty much tells it all. He’s an over inflated ego maniac with delusions of grandeur. Although he’s pretty petty and one dimensional Rufus isn’t a total bad guy it’s just that his ego and own stupidity keep making him look like a buffoon. Rufus could be dropped in dang near anywhere for some comedy relief. He would likely go through the same pattern of trying to find and beat Ken Masters and constantly mistake him for someone else. Jean Paul Valley might make a good replacement although the former Batman is likely to seriously injure Rufus. It could be interesting watching him try to backward rationalize that he got the crap kicked out of him. Perhaps Ken Masters doesn’t even exist and he’s just a total figment of Rufus’s imagination. Go ahead and have some fun with it! Adrenaline Surge only works on Paralysis and Martial Artist. Growth is always on and is innate. Paralysis has range of touch only. 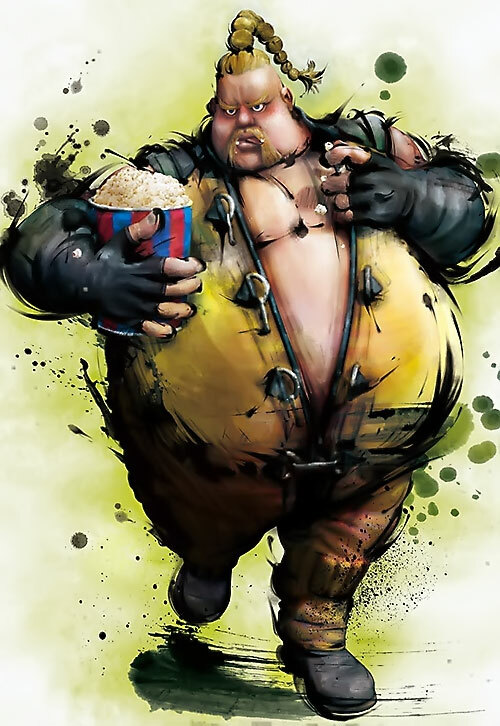 Dependent (Candy), CIA (overconfidence and beating Ken Masters), SPI (delusions of grandeur), Minor Rage, Socially Inept. 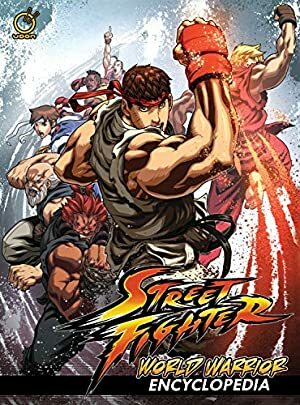 Source of Character: Street Fighter.